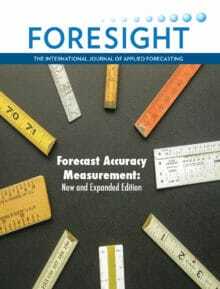 The newest Foresight guidebook, Forecast Accuracy Measurement: Pitfalls to Avoid and Practices to Adopt is designed to enhance your use of appropriate practices in forecast accuracy measurement, and to suggest alternatives that may provide new and better insights. Written by top forecasting practitioners, consultants and academics, this essential guide will verify your use of valid practices, will expose invalid measurement procedures, and will bring you up to date on best-practice techniques. Can We Obtain Valid Benchmarks from Published Surveys of Forecast Accuracy?